The Cash Requirements Report can be used to determine, on a general basis, which invoices can be paid with the available cash or to determine exactly how much cash would be required to bring your A/P up to a certain status. For example, the report will tell you at a glance exactly how much cash would be required to pay off all invoices due up to a certain date (called the cut‑off date). The report itemizes these totals by vendor and optionally details vendor invoices as well. It shows any discounts available on past due and current invoices as well as discounts lost by reason of not paying the invoice by the discount date. It also shows discounts now avail­able that would be lost if the voucher is paid on the next payment date. These are shown as Optional invoices. One important use for this report is to help you choose a suitable cut‑off date (due date through which to pay invoices) for generalized payment selection. Generalized Payment Selection is part of the Payment Preparation application, which allows you to automatically select invoices for payment. The cut‑off date used in Generalized Payment Selection will determine how many vendor invoices are selected for payment. Running the Cash Requirements Report with a given cut‑off date will show you the total cash that will be required if that cut‑off date is used in Generalized Payment Selection. If the total cash required is too high, the cut‑off date would be moved back. If the cash required is lower than available, the cut‑off date can be moved forward. When the cash required versus the discounts gained and payments made is correctly optimized, then Generalized Payment Selection can be run, using the same cut‑off date. Any needed manual adjustments to these selections can then be made, and you are ready to print checks. This date controls the number of past due and/or current invoices, which will be included on the report. All invoices having due dates falling on or before this date will be included as either past due or current invoices. Setting the cut‑off‑date earlier than the payment date will cause the report to print only invoices which are already past due on the payment date, therefore no current invoices will be included at all. This would be done if there was only enough available cash to pay past due invoices. Setting the cut‑off date on or after the payment date will cause all past due invoices to be included on the report. Any other invoices with due dates on or before the cut‑off date would be included as current invoices. Ideally, the cut‑off date would be set to the next payment date. When this is done, then paying all past due and current invoices on one payment date guarantees that there will be no overdue invoices on the next payment date. This is because any invoices due by the next pay­ment date would have been paid the payment period before. This is the date on which the A/P checks will be printed and/or mailed. It determines which vendor invoices will be past due and which will be current as of the issue of the check. This is the next date after the payment date on which you will print and mail A/P checks. It will help determine which discounts are currently valid for this payment and will not be valid for the next payment of Accounts Payable (see Optional). These are any invoices, which will already be overdue when checks are run. For example, an invoice's due date is the 9th of March and checks will be printed on the 10th of March. The invoice is past due. Only past due invoices having due dates falling on or before the cut‑off date will be shown on the report. These are any invoices which are not yet overdue and which have due dates falling on or before the cut‑off date. For example, an invoice's due date is the 15th of March. Checks will be run on the 10th of March and the cut‑off date is the 17th of March. The invoice is current because it is not overdue this week, but it will be due by the cut‑off date. 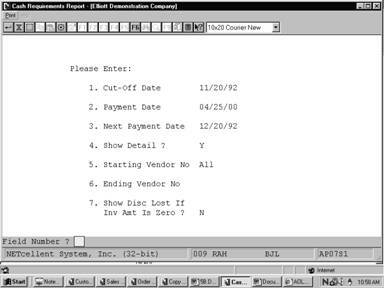 This class of vendor invoices includes invoices with due dates falling after the cut‑off date, but for which an early payment discount will be lost if they are not paid on this check run. For example, checks will be run on the 10th of March. An invoice has a 2% discount, which can be taken if the invoice is paid by the 15th. The invoice is not due until the next month, but the next check run will be on the 17th. The cut‑off date is the 16th. This is an optional invoice since its due date falls after the cut‑off date but the 2% early payment discount will be lost unless the invoice is paid on the upcoming check run. In short, an optional invoice is one with a due date falling after the cut‑off date, but which must be paid on this check run to get the early payment discount. The cut‑off date is the last invoice due date to be included on the report. This would optimally be the same as the next payment date, to avoid past due invoices. See the Application Overview for a more detailed description of the cut‑off date. All invoices having due dates falling on or before this date will be included on the report as either past due or current invoices. This date defaults to the last cut‑off date used in this application or Generalized Payment Selection. Enter the date that checks will be printed and mailed. This date will be used by the system as the current date for determining whether invoices are past due. 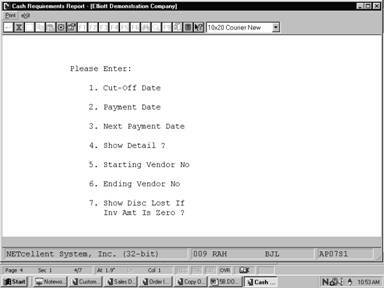 This date defaults to the last payment date used in this application or the Generalized Payment Selection function of the Payment Preparation application. Enter the next date after the payment date that checks will be run. This date is used by the system to determine whether any early payment discount will be lost if the invoice is put off until the next check run. This date defaults to the last next payment date used on this application or the Generalized Payment Selection function of the Payment Preparation application. If you wish to have all vendor invoice details on the report, answer Y. If you wish to have the report print with only vendor totals and no details, answer N.
The default is Y, meaning include vendor invoice detail. Enter the beginning of the range of vendor numbers, which you want to have print on the report. The default is All, meaning for all vendors. This field will not be entered if All is selected for the starting vendor number entry. Enter the end of the range of vendor numbers, which you want to have print on the report. This field defaults to the starting vendor number entry to make it easy to print the report for a single vendor. 7. Show Disc Lost If Inv Amt Is Zero ? If you wish to print invoices that have been paid but there was a discount lost, answer Y. If you do not wish to print these invoices, answer N.
The default is N, meaning the invoices will not print on the report. Thru 02/10/93 For Payment On 01/24/93 (Next Payment Date Is 02/10/93).